The SureTemp Plus 692 Thermometer allows for easy, safe, and accurate testing with the durability to withstand continuous use in busy healthcare settings. With 4-second oral, 10-second pediatric axillary, 15-second adult axillary, and 10-second rectal measurements, the Suretemp 692 is one of the fastest thermometers on the market. Ergonomic design - comfortable to hold, easy to use, and very durable. Interchangeable, removable probe wells reduce the risk of cross-contamination. Large LCD displays easy-to-read temperatures. Includes a 60-second pulse timer for counting pulses and respiration. Mechanical and electronic security options help prevent theft. Takes approximately 5,000 readings on 3 "AA" batteries. Adult Axillary (18 years and older): Approx. 15 secs. Pediatric Axillary (17 years and younger): Approx. 10 secs. 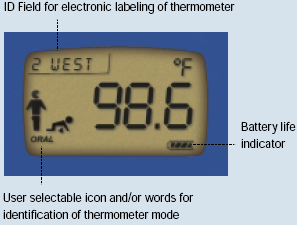 3-year limited warranty on thermometer. 1-year limited warranty on probe. 90-Day limited warranty on probe well.